Meanwhile the bill that would fund the tunnel was approved by the Senate last week, and passed out of the House Committee yesterday afternoon. Before coming to the floor for a full House vote, the bill now must pass out of the House Rules Committee, and House Speaker Frank Chopp has the power to essentially kill it there. All indications are that the bill would pass a full House vote, yet Chopp has been skeptical of the tunnel plan. Yup, the most powerful politician in Washington State. Posted by dan bertolet on	Thursday, April 2nd, 2009 at 11:57 pm. You can follow any responses to this entry through the RSS 2.0 feed. You can leave a response, or trackback from your own site. 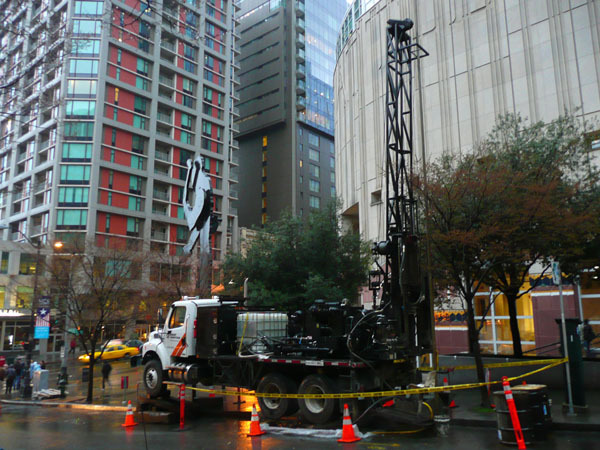 There is a drilling rig at 1st and Spring too. Let’s hope this is confirmation that the tunnel will go forward. There’s one by my place at First and Stewart as well. I think that is a confirmation that it is for the tunnel. drillbabydrill. Viaduct=B A D. Tunnel=mmmm…G O O D. Reclaim the WF=VERY GOOD. OK, I am not really SP, but I do like tunnels :).